AA4F Key Contact Cleaner - The key contact cleaner will keep your key working perfectly with occasional use. 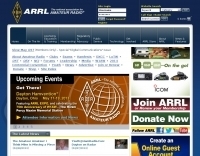 AR2 communications - Complete catalog of low noise preamplifiers and microwave Gunnplexers. BHI Ltd - Noise eliminating products. Remove unwanted background noise and interference leaving only the speech. Clear communications, listen stress free. Dsp noise cancellation solutions. CAIG Home of DeoxIT - Caig labs - featuring advanced contact cleaners deoxit, deoxit gold (progold) and deoxit faderlube (cailube mcl) for manufacturing, maintenance and service. CAL-AV Labs, Inc. - Cal-av labs, inc. (formerly california avionics laboratories, inc.) manufactures electronic instruments and systems for research and industry. we specialize in radio communications and research/electronic test products. Amateur radio yagi antennas, rotary dipoles, baluns, morse keys. Comelec - Electonic kits, for adio,hi-fi , meteo, gadjets, medical and measure. Communications Specialists Inc. - Manufacturers quality tone signaling, wildlife telemetry,avionics equipment,video transmision modems. Gold Line - Manufacturer of professional audio test and analysis equipment and of cb, marine and amateur radio accessory equipment. Ham Radio Challenge Coins - Ham Radio Challenge Coins, Ham Radio Pins, Amateur Radio Badges, Military Coins, MARS Coins, Amateur Radio Coins. Idiom Press - CW keyers, Logikey, and antenna rotator controll like rotor-ez, and active audio low pass filters. K2RF Communications Products - K2RF is a manufacturer of radio frequency, audio, and video processing products including repeater link controllers, speech limiters, and RF equipment for the commercial, HAM, and amateur radio consumer. Lido Mounts - Mounting solutions for amateur radio. Cup holders, vent mounts, windows mate, HT holders. Magnecor - Finally auto ignition noise suppressor wires that really work. Maha / Powerex - Portable electronics, amateur radio, pro audio and digital cameras batteries, chargers and conditioners. Otto Engineering - OTTO Communications designs and manufactures audio accessories for two-way radios used in public safety, police, fire, retail, hospitality manufacturing and other markets. Pravacy Speaker PMR446 - We are a leading developer and manufacturer PMR446 in Korea. Our new developed PMR446 model no. IFR-100 has new function like as private speaker it allow not to speak out from the radio and only you can hear the communication by using a private talk mode. Scanner Standman - These are custom built adjustable stands that hold handheld scanners, handheld amateur radios, two-way radios and FRS communicators. The BetterRF Company - Dedicated to providing superior products to the Amateur community. screwdriver Control, Icom 7000 and IC 706 tune control, voice and cw keyers for Icom Radios, yaesu tune control. Top Ten Devices - Automatic band decoder, six way antenna relay, band reject coaxial stubs and more. Top Ten Devices is a two-man company formed in 1991 by N3RD and W2VJN. Warren Gregoire & Associates - Boom Microphone Headsets for use on amateur transceivers- assembled and kit form. WaveNode Precision Station Monitoring - The WaveNode WN-1 is a precision, full-featured Amateur Radio Station Monitoring System which now includes Audio Announcing for RF power, SWR, and DC monitoring using HF and UHF remote sensors. West Mountain Radio - West mountain radio, Useful electronic hobbyist products, RigBlaster and RIG Runners products, Waukesha, WI. Search only in "Communication Accessories Manufacturers"